A unified and scalable architecture provides centrally managed backup and disaster recovery for physical and virtualized environments with disparate OSs, storage platforms, hypervisors and business applications across data centers and remote sites to a range of backup targets including disk, tape and cloud. Secure backup and restore is enabled with features such as Secure Peering which sends all communication between Installation Server and Data Protector Cell Manager via a secure Transport Layer Security 1.2 channel; Centralized Command and Control which allows only the Data Protector Cell Manager to send commands to the Data Protector clients, ensuring data integrity; and encryption which secures data by encrypting traffic over the wire. REST API authentication and authorization layer, a secure interface to access Data Protector, enables seamless integration of backup and recovery tasks with customers’ service portals or applications. Support for mission-critical applications and databases is enabled with online extensions for business applications including Microsoft Exchange, Microsoft SharePoint, Microsoft SQL, Oracle, SAP, SAP HANA, IBM Db2, Sybase ASE, PostgreSQL, and MySQL to provide application-aware backup and recovery. 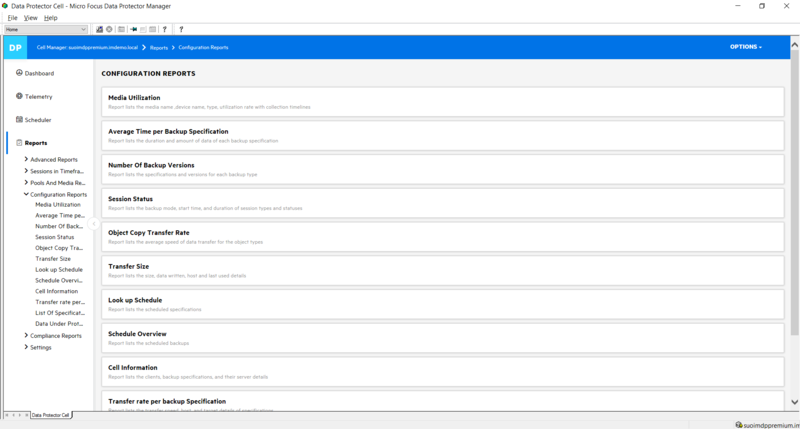 Granular recovery is enabled with extensions which enhance the application management GUI with backup and recovery capabilities, and provide application owners with a self-service option to search and recover single items. Data Protector Express supports backup and restore of virtual environments and includes features such as snapshot integration, cloud and encryption support. It offers socket based licensing to provide predictable licensing capability with no monitoring required for virtualized workloads. Agent or agentless VM consistent backup is available based on your requirements. 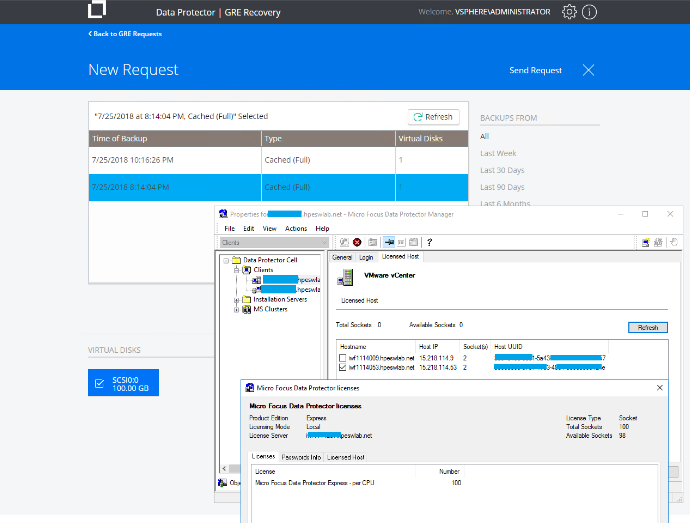 Agentless backup uses VMware or Microsoft Hyper-V APIs to back up multiple VMs and their VM disks in parallel and stream them to a backup device. Also supported is hardware-assisted agentless backup which leverages storage snapshot integration to complete the backup operation, offloading the hypervisor and improving the VM performance and availability. Advanced restore operations for VMware offer many options including non-cached granular recovery which allows to recover the entire VM before reading its file content; cached granular recovery for recovering select files from a virtual machine backup image directly from a supported backup target; Virtual Machine Power On which allows VMs to be powered on instantly from the backup images that reside on supported devices; and Virtual Machine Live Migrate which enables to power a VM on from the backup image that resides on a supported device, and simultaneously start the data restoration to the destination data store. Data Protector’s extensive support matrix enables you to standardize data protection across physical and virtual environments which include a variety of applications, data formats, storage platforms, operating systems and hypervisors, and back up your data to a range of targets, including disk, snapshots, tape and cloud. Integrations with storage include Zero Downtime Backup when using Micro Focus storage, allowing Data Protector to create, back up, and catalog space-efficient, application-aware snapshots. Instant recovery stages the desired number of replicas on the storage array and restores data from the replicas chosen for recovery. Integration with StoreOnce Catalyst and Dell EMC Data Domain Boost enables federated deduplication which can run either on the application server, on the media server, or on the target backup appliance, reducing network bandwidth consumption. NDMP-based backup and recovery integrations are available with storage vendors such as Dell EMC, NetApp and Hitachi simplifying NDMP backup configuration and management. Backup to the cloud is enabled with native integrations, cloud gateways and backup appliances. Native integrations with Microsoft Azure, Amazon S3 and S3 API-compliant storage such as Ceph and Scality allow seamless backup to cloud. Support for cloud gateways, such as a StoreSimple gateway for Azure or Amazon AWS Gateway, allow to offload backup data to the cloud if a gateway is required. Support for backup appliances, such as StoreOnce CloudBank, enable seamless data transfer between on-premises backup data sets and cloud targets such as Amazon S3 and Microsoft Azure without the need for a gateway. Automate DR with centralized bare metal recovery from or to physical and virtual systems from any existing file system or image. Bare metal recovery for Windows and Linux clients functionality is enables with Enhanced Automated Disaster Recovery (EADR) which allows clients and cell managers to collect relevant environment information automatically at backup time and to package the OS data and configuration files in a single large DR image. One Button Disaster Recovery (OBDR) allows clients to use OBDR device to copy an image file onto a tape. When disaster occurs, the OBDR device is used to boot the target system directly from that tape. Bare metal recovery for UNIX clients is supported with the Disk Delivery Disaster Recovery (DDDR) feature which allows Data Protector to recover faulty disk sub-system using an auxiliary disk if the client system is not available or creating a new one if the client system is online. Track and manage SLAs for critical applications with key performance indicators. Enjoy the convenience of generating detailed reports from a single console. Use business dashboard to track backup KPIs. Orchestrate and automate workflows to reduce administration time and minimize operation errors. Integrated reporting is available with Data Protector Express and Data Protector Premium allowing administrators to view client backup statistics, licensing, sessions, configurations, schedules, and much more, in order to effectively monitor the backup environment. 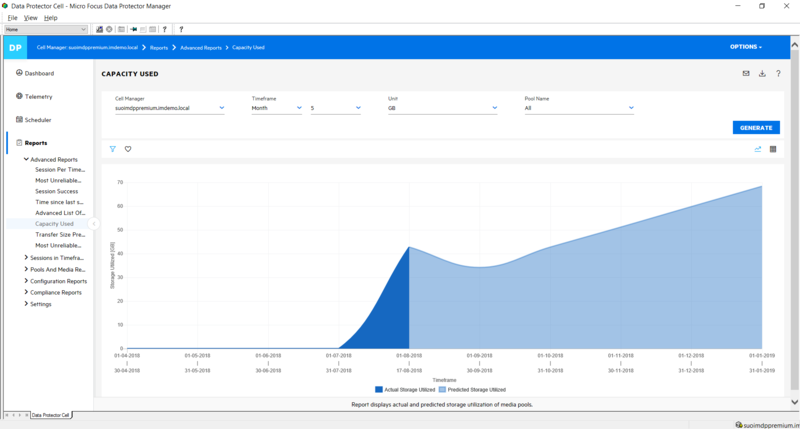 Built-in predictive analytics engine provides trends and scenario-based modeling, potential scheduling conflicts and resource contentions, and the impact of new workloads on backup infrastructure enabling better management and planning of backup processes. 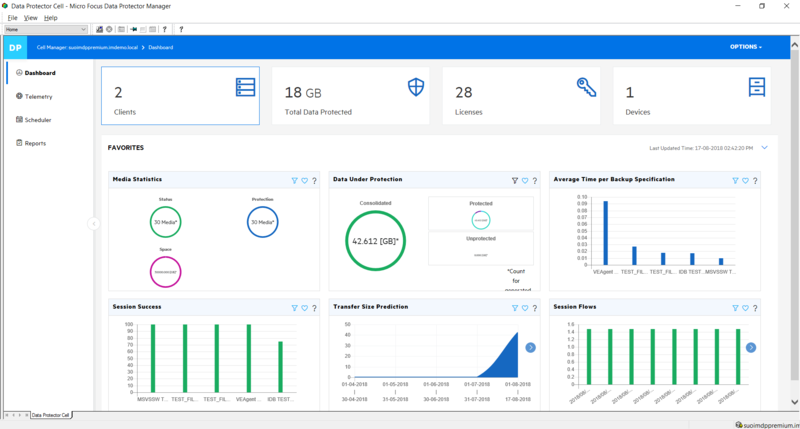 Business Value Dashboard (BVD) provides a fast and easy overview of backup success rates to business executives or admins. Operations Orchestration incorporates Data Protector workflows to automate routine backup and recovery tasks such as backing up and restoring files, monitoring cell manager tasks, provisioning of backup agents, monitoring the health of the cell manager’s services, verifying a backup or checking the data on a medium, and managing sessions.